1:1 From: Paul, Silas,1 and Timothy. To: The Thessalonian church, the people of God the Father and the people of our leader, Jesus the Messiah. Peace to you. Kindness as well. 1:2 We never stop thanking God for all of you folks. We never stop praying for you, either. 1:3 When we talk to God our Father, we remember how you put your faith to work. It’s a labor of love. And it all starts with your unshakable hope, which our leader, Jesus the Messiah, gave to you. 1:4 Without a doubt we know that God loves you and he chose you. 1:5 We know it because the Good News we brought to you wasn’t just a wind bag full of words. We backed those words with power. The Holy Spirit convinced you that we were telling the truth. You saw what kind of men we are and the concern we have for you. 1:6 By the time we left, you were already imitating us and our leader, Jesus. You believed what we taught you. And you lived like it, with joy that comes from the Holy Spirit. You did all of this in spite of your troubles. 1:8 You have managed to shout out God’s message all over the place, even beyond Macedonia and Achaia. Everyone seems to know about your faith in God. We don’t need to tell them. 1:9 In fact, these people even talk about how well you treated us when we came to your town, and how you stopped worshiping idols and started worshiping the true God, who’s very much alive. 1:10 These folks say they’ve heard you’re waiting for God’s Son in heaven to come back. They tell us he’s the Son whom God raised from the dead, and the one who will save us from the punishment that’s coming. Paul used the Greek version of his name: Silvanus. Macedonia and Achaia were territories in what is now Greece—Macedonia in the north and Achaia in the south. The background story of Paul going to Thessalonica and what happened there shows up in Acts 17, 18. It’s part of the story of how the Christian movement got started. After only “three weeks” (Acts 17:2), they got run out of town by a mob who called them “traitors. They aren’t loyal to Caesar. They pledge their allegiance to another king called Jesus” (Acts 17:7). Yet Paul opens his letter to them as though he spent a long time there building friendships. How do you think Paul and the Thessalonians could have made such a good impression on each other in such a short time? Paul says something a bit perplexing. Instead of saying the Thessalonian people put their hope in Jesus, he says they have hope because Jesus gave it to them (1:3). What do you think Paul is trying to say here? Paul compliments the people of Thessalonica for their faith “in spite of your troubles” (1:6). Paul doesn’t say what those troubles are. 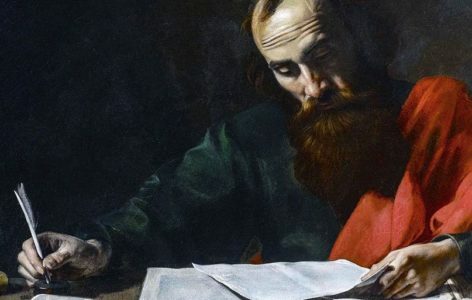 Based on what you’ve heard of Paul’s troubles in the past, during his mission travels, what kind of troubles would you guess he was talking about? LIFE APPLICATION. Paul wrote, “We never stop thanking God for all of you folks. We never stop praying for you, either” (1:2). To whom could you write something like that? LIFE APPLICATION. Writing from Corinth, a 300-mile walk (483 km) south of Thessalonica (400 miles/645 km by sea), Paul says everyone in what is now Greece seems to have heard about the people of Thessalonica getting religion: “You have managed to shout out God’s message all over the place” (1:8). Have you ever known of a church like that, which had a reputation for believing in Jesus and living like it? If so, what was it about that church that got people talking?